LAUREL - Among a group of outdoors and health organizations gathered for a “Sussex Outdoors” summit today at Trap Pond State Park, Governor Markell previewed his vision for a long term “Statewide Trails and Pathways” project for Delaware. The Governor has charged the Delaware Departments of Natural Resources and Transportation with bringing the vision to life. The proposed program would establish an interconnected network of pathways and trails throughout the state to support non-motorized travel and recreational trails that could be enjoyed by Delawareans and by visitors. And, develop strategies for the ongoing maintenance and upgrades of existing facilities. DelDOT and DNREC have identified seventeen (17) proposed projects for discussion and possible construction over the next 2-3 years, covered by an initial investment of $7 million earmarked for trails in the 2012 Bond Bill. This funding will maximize the state’s ability to leverage federal and private dollars for these projects. 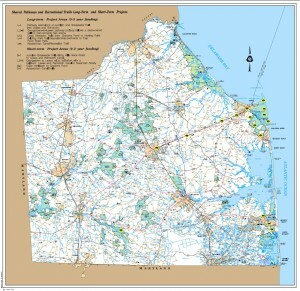 A map of the proposed trails and pathway project areas in Sussex County can be found here. Tomorrow, at the Delaware Bike Summit to be held at the University of Delaware’s Virden Center in Lewes, DelDOT Secretary Shailen Bhatt and DNREC Secretary Collin O’Mara will sign a Memorandum of Agreement outlining the responsibilities and activities of each agency to build our trails network, with financial stewardship of the program shared by both agencies. They will also unveil the New Castle County and Kent County proposed trails and pathways projects to biking advocates, elected officials and community leaders who are discussing ways to make Delaware more bicycle friendly. DNREC and DelDOT will also conduct a series of workshops on proposed trails so that property owners, community groups, and other interested citizens have an opportunity for input on the locations and types of trails to be constructed. According to the latest State Comprehensive Outdoor Recreation Plan survey, conducted by DNREC’s Division of Parks and Recreation, 91 percent of Delawareans consider outdoor recreation important to them personally.